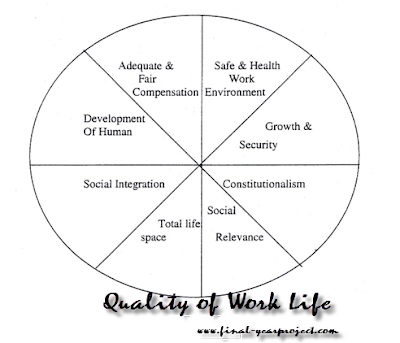 This is MBA project report on "Quality of work life" with objective to find out effects of quality of work life and to find out way to improve quality of work life. The report start with introduction and objective of the study. Quality of life (QWL) refers to the relationship between a worker and his environment, adding the human dimension to the technical and economic dimensions within which the work is normally viewed and designed. You can also Subscribe to FINAL YEAR PROJECT'S by Email for more such projects and seminar. Quality of work life has gained deserved prominence in the Organizational Behavior as an indicator of the overall of human experience in the work place. It expresses a special way of thinking about people their work, and the organizational in which careers are fulfilled. QWL focus on the problem of creating a human working environment where employees work co – operatively and achieve results collectively. Quality of work life covers various aspects under the general umbrella of supportive organizational behavior. Thus, the QWL should be broad in its scope. It must be evaluate the attitude of the employees towards the personnel policies. Use this project report for your reference and study work only.